Welcome to the point heart of Forigo Roteritalia website, deep inside our activity. In this wide and unique series of solutions specialized in soil preparation, which include more than 400 machines, it’s possible to recognize our Company philosophy. We organized our products in 14 macro-categories, each of those is represented by a picture, which you can find in the section below. By clicking on each picture, you can consult the machines family list. The machineries we develop and manufacture, cover every kind of soil preparation necessity (and other strictly related operations) in the agricultural sector as much as in the horticultural and special cultivations. Bed-shaping activities; plastic film and T-tape irrigation pipe laying; potato ridging and leaves topping, maintenance of grasslands, orchards and groves; shredding and processing of uncultivated fields with high presence of stones and cultural residuals; deep distribution of liquid and granular fumigants also combined with tilling activity; litters renovation for the poultry farming sector. Power harrows complete series, fixed and folding, for every kind of field conditions and tractor horsepower. A wide series of fixed, movable and folding models, suitable for hobby and professional jobs, taking great attention to details and customizations. Shredders series include fixed, movable and reversible machines suitable for open fields as well as for orchards/vineyard maintenance. 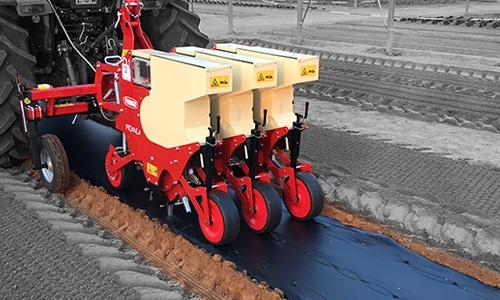 The largest and richest series of solutions on the market suited for excellent preparation of hard-packed, stony, uncultivated soils in just one working step. A huge variety of solutions, specifically designed for the bed shaping soil preparation in the vegetable sector. Efficient solutions for new beds shaping or post-harvesting beds renewal with a wide range of working depth settings 5 to 25 cm. Machinery suitable for superficial jobs and bed surface renovation, ideal for the stale seedbed technique and weeds treatments. Large series of solutions for the pto driven potato ridging, adaptable to additional complete soil tillage purposes, both with bed shaping and flat soil preparation. Machinery designed and manufactured for a faster and easier potato collecting process, maximizing the output and the quality with a low environmental impact. Designed for a fast and sure application of granular and liquid products, with one unique process. An entire series of machines apt to stretching the nylon film. Available in different versions and tailor-made as well. Power harrows, rotary tillers, shredders and stone buriers powered by a hydraulic orbital motor, suitable for different pulling systems through customized linkages. Exclusive machine with innovative specs, specialized in litters renewal in the poultry farming sector. Exclusive precision seed drill, ideal also for sowing directly on mulching films. AND NOW THAT YOU DID CONSULT OUR CATALOGUE? Forget all about it. The thing that constitutes the ultimate essence of the solutions we propose is the fact of making the tailoring a real vocation. Each one of the machines you can find on our catalogue was not born from a simple idea, but from a real need of which it represent the answer. This is why our solutions are tailor-made. Our team of experts and our technical department are constantly committed in the study, analysis and elaboration of new products: the next one might be yours. Tell us which are your needs and the results you would like to obtain filling the form here by the side!